A new page has been published in the story The Purloined Patents of Doctor Brackett, at Thrilling Tales of the Downright Unusual. 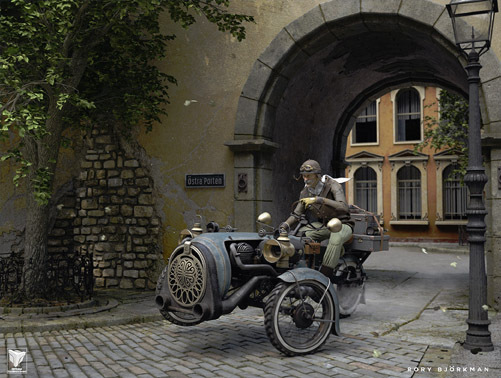 Rory Björkman’s The Journey is a beautifully lit, modeled and textured image of a crusty old fellow on his crusty old three-wheeler. 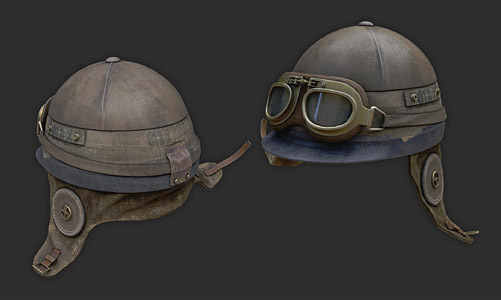 You can see the full image and loads of details, color tests, and other preliminary versions here. 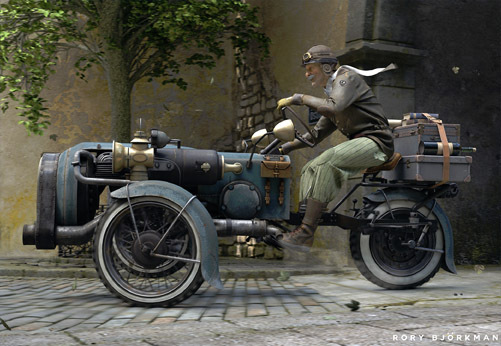 It’s all worth looking at, from the many versions of the trike’s grille through the test renders of the helmet, the baggage, and many other elements from the picture. It’s really wonderful work, all of it. In fact, you shouldn’t stop there: you can see a much larger gallery of Björkman’s work on this page, where I especially recommend Sky Machine No. 47. Nice! I came for the chairs; I stayed for the scooters. 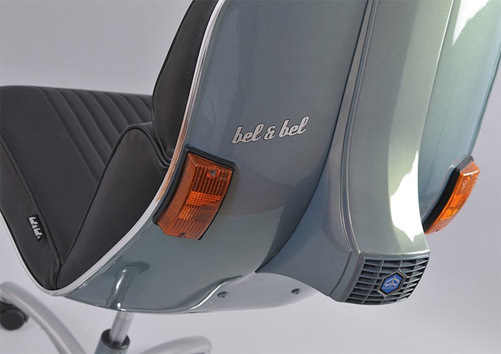 Almost everything is scooters at Barcelona’s Bel & Bel Studio where old body parts from Vespas, Volkswagens, and other vehicles are repurposed into furniture and other works. They even do full restorations on vintage Vespas… when they’re not looting them for their shiny bits. 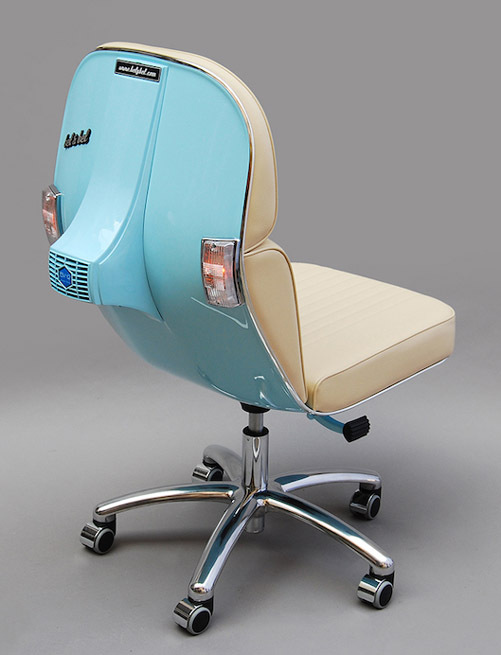 It was the fanciful office chairs that drew me in. Mind you, I’m awfully fond of the tired old chair I use here in the Secret Laboratory. But I flirted briefly with these streamlined beauties before I assured my chair that no, no, I would be faithful. You can see why I was tempted. But then I scrolled down to the self-balancing scooters, which by any other trademark would be called Segways… and suddenly I had a vision of myself zipping down the street in the dorkiest way possible, goggled and scarved, and I figured I was home. You get the idea. If you’re going to look ridiculous, do it with streamlined style. 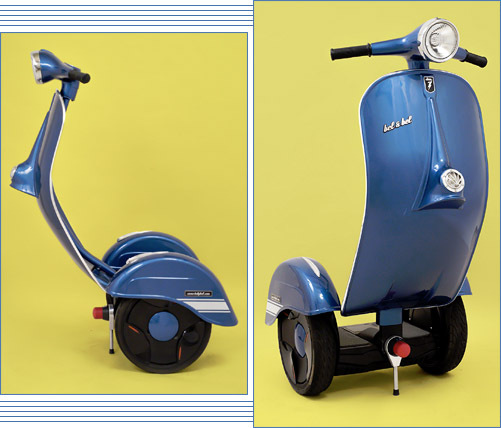 In a perfect world, which at the moment would be a world where I didn’t need any exercise, you’d find me rolling off on one of these to the library, or to the grocery store, or down to the harbor, pretty much any day at all. With a big stupid grin on my face and that mounting sense of guilt and dread I get when I’m not working. Anyway, do yourself a favor by dropping by the Bel & Bel web site where you can dream a little, if only for a few minutes. They’ve got loads of interesting furniture conversions and gadgets, as well as making-of videos. There’s plenty to keep you occupied.